The Korean National Parks, like the National Treasures, provide a look at the heart and soul of Korea. The Parks host and protect many of South Korea's sacred, historical, and beautiful sites. From each of those perspectives, the Parks reveal the diversity of Korea. The Parks protect and present to the public the spirituality of ancient Buddhist sites throughout the nation. The natural beauty, the beauty of nation with much of the land in a mountainous and/or sea setting, has been protected and opened to the public. Although the National Park service has a short history of 40 years, already tremendous strides have been taken open Korean history, culture, and beauty to all. The national park system in Korea celebrated its fortieth anniversary, and the twentieth anniversary of the Korea National Park Service (KNPS) in 2007. Korea National Park The KNPS operates its own police force, and since 1998 has been under the jurisdiction of the Ministry of Environment. The Park Service prohibits most forms of development in the system, cover a total of 6.6 percent of the country's area, typically located in mountainous or coastal regions. Jirisan National Park in the southwest, the country's largest mountain park, also holds the distinction of the first designated national park in 1967. Dadohae, the largest marine park, measures more than 2,200 km², almost all water. Wolchulsan sits at the bottom of the list for size with only 56.1 km². Jirisan National Park, in Jeollanam-do, Jeollabuk-do and Gyeongsangnam-do, 471.75 km², designated as the first national park on Dec. 29, 1967. Jirisan, considered the founding place of Buddhism in Korea, hosts a number of sacred historical sites in Korea including Hwaeomsa, one of the ten most famous temples in Korea, Naewonsa (Temple), Beopgyesa (Temple), Silsangsa (Temple), and Yeongwonsa (Temple). Known as on of the three mountains where God dwells (Samsinsan), Jirisan ranks with Geungangsan and Hallasan. The site has been referred to as Duryusan or Bangjangsan, indicating a place of the highest state of enlightenment. Cheonwangbong is the second highest mountain in Korea at 1,915 meters. Gyeryongsan National Park in Chungcheongnam-do and [Daejeon]], 64.68 km², designated as a national park on December 31, 1968. Gyeryongsan achieved fame in China during the Three Kingdoms period as a mountain area of exceptional beauty. Koreans considered the site holy, conducting important rituals on the peaks. Gyeryongsan had been a candidate for capital of Joseon, Several renown temples reside in Gyeryongsan National Park including Donghaksa (Temple), the college of the Buddhist priesthood for Buddhist nuns, Nammaetap pagodas, Gapsa (Temple) (considered one of the three great ones - Tongdosa, Songgwangsa, and Hwaeomsa). Seoraksan National Park in Gangwon-do, 398.53 km², designated as National Park in March 1970, is divided into Oe (Outer) Seorak, Nae (Inner) Seorak, and South Seorak. has Buddhist temples tucked away in the mountains including Sinheungsa (temple), Gwongeumseong (high in the rocks), Baekdamsa (Temple) (the retreat of famed poet monk Han Yongun). Songnisan National Park, in Chungcheongbuk-do and Gyeongsangbuk-do, 274.54 km², designated as a national park on March 24, 1970. Songnisan, meaning "renouncing the world," considered by many as one of the eight most beautiful places in Korea. Beopjusa (Temple), considered the greatest temple in Korea, sits tucked away inside Songnisan. Smaller temples like Sujeongam, Jungsajaam, Bokcheonam, also grace Songnisan. The park is the site for the immensely popular made for TV drama, "Taejo Wanggon," the first King of Goryeo Dynasty. Hallasan National Park at the center of Jeju-do, 153.39 km² in size. The dormant volcano Hallason, or Mount Halla, numbers among the "three mountains where God lives" (Samshinsan) in Korea. Hallasan stands as the tallest mountain in Korea, rising 1950 meters. 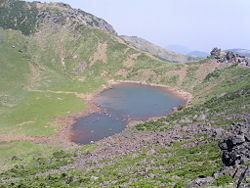 Baengnokdam, or White Deer Lake, crater has a depth of 110 meters. Naejangsan National Park, designated as a National Park on November 17, 1971, in Jeollanam-do and Jeollabuk-do, 81.72 km². Considered one of the eight most beautiful places in Korea. Gulgeori trees (Natural Treasure No. 91) and Bija trees (Natural Treasure No. 153) grow in the park. Naejangsa (Temple), Baegyangsa (Temple), Wonjeogam (Temple), Byeongnyeonam (Temple) (A noted calligrapher of the Joseon Dynasty, Kim Jeonghui resided here), Ibamsan Fortress. Gayasan National Park, in Gyeongsangnam-do and Gyeongsangbuk-do, 77.07 km², designated the ninth National Park of Korea on October 13, 1972. Gayasan received its name from the shape of the mountain, resembling the head of a cow (Udusan). Haeinsa(Temple) and Palmandaejanggyeong, housing the Tripitaka Koreana carved on over 80,000 wood blocks sit secluded in the mountains. The renown monk Samyeongdaesa resided in Hongjeam Temple in the 1600s. Other sacred Buddhist sites include Hirangdae, the retreat of monk Hirang, and Cheongnyangsa (temple). Deogyusan National Park in Jeollabuk-do and Gyeongsangnam-do, 231.65 km², designated as the tenth National Park on February 1, 1975. Joseon Dynasty Jeoksangsanseong(Fortress), Anguksa (Temple), Rajetongmun (Gate), the ancient border between Silla and Baekje, Baengnyeonsa (Temple), Wontongsa (Temple), and Songgyesa (Temple) rest within the park. Odaesan National Park, designated a National Park on February 1, 1975, in Gangwon-do, 303.93 km². Odaesan is considered one of the four greatest mountains in Korea along with Geumgangsan, Hallasan, and Jirisan. Four National Treasures Sangwonsa Dongjong (bronze bell), Sangwonsa Munsudongja Jwasang (seated statue of child monk), Woljeongsa palgakgucheung seoktap (octagonal nine-story stone pagoda in Woljeongsa temple), Sangwonsa Jungchanggwonseon-mun(book) along with two treasures and local treasures. Woljeongsa(temple) and Sangwonsa (temple) nestle in the park. Juwangsan National Park in Gyeongsangbuk-do, 107.43 km², designated as the twelfth National Park on March 30, 1976. A rocky refuge, kings have hidden during a rebellion in the mountains. Daejeonsa [Temple], with Bogwangjeon, a royal palace, designated Tangible Treasure No. 202 of Gyeongsangbuk-do(Province). The renown monk, Samyeongdaesa, who recruited soldiers and trained them during the Japanese invasion, resided there. Two temples, Juwangam and Baengnyeonam in Daejeonam, stand nearby. Juwangam [Temple] and Juwangul [Cliff and Cave] sit the the park. Bukhansan National Park in Seoul and Gyeonggi, 79.92 km², designated as fifteenth national park in Korea on April 2, 1983,. At Bukhansan, you can see the 500-year-old fortress wall (Bukhansanseong), many temples including fifteen traditional temples and over 100 small attached temples including the old temple Doseonsa, Hwagyesa (Temple), Seunggasa (Temple), Jinwansan (Temple), Mangwolsa (Temple), and Taegosa (Temple). Chiaksan National Park in Gangwon-do, 181.63 km², designated as the sixteenth national park in Korea on December 31, 1984. The north ridgeline from Guryongsa(Temple) to Birobong(Peak) is especially famous for its steepness. Sangwonsa(Temple)sits at the highest place in Korea, Namdaebong Peak (1,181m). Other temples include Guryongsa (Temple), Ipseoksa(Temple), YeongWonsa (Temple), and Gukhyangsa (Temple). Yeongwonsanseong (Mountain Fortress Wall), Ipseoksa Pagoda and Mireuktap(Pagoda) also stand in the park. Woraksan National Park, in Chungcheongbuk-do and Gyeongsangbuk-do, 287.98 km², designated the seventeenth national park on December 31, 1984. Mireungnisaji (Temple Site), Deokjusa (Temple), and Deokjusanseong (Fortress Walls) lay within the park. Sobaeksan National Park in Chungcheongbuk-do and Gyeongsangbuk-do, 322.38 km², designated a national park on December 14, 1987. Meaning "small mountain" in Korean, the mountain is actually gigantic, third only to Jirisan and Seoraksan. Buseoka (Temple) and Sosuseowon have served to nurture Buddhism and Confucianism in Korea for about 1,000 years. Huibangsa (Temple), built around 500 C.E., has a long history fostering monastic Buddhism in Sobaeksan refuge. Wolchulsan National Park in Jeollanam-do, 56.1 km², became Korea's twentieth national park on June 11, 1988. Legend maintains that 99 small and large temples have resided in the Wolchulsan area. Koreans have bestowed spiritual qualities to "female" and "male" rocks, "Yeongam" numbering among them. Byeonsanban-do National Park in [Jeollabuk-do]], 154.72 (9.2 km² water), designated the nineteenth National Park on June 11, 1988. Byeonsanban hosts ancient temples including Gaeamsa, Naesosa, and Wolmyeongam. The Yucheolli ancient ceramic ware remains, the Guamni dolmen site, Hobeolchi, and Ugeumsanseong mountain fortress wall are situated in this national park. Dadohae Haesang National Park, in Jeollanam-do, 2,321.51 km² (1,986.68 km² water), designated as Korea's fourteenth National Park on December 23, 1981. Dadohaehaesang has the distinction of being Korea's largest national park. Jang Bogo defeated Tang (China) and Japanese invaders in Dadohaehaesang. During the Goeryeo dynasty, Song and Won dynasty China, as well as Japan, traded through the area. Hallyeo Haesang National Park is the first National Sea Park, in Jeollanam-do and Gyeongsangnam-do, 545.63 km² (395.48 km² water), designated on December 31, 1968. Designated second place for scenic beauty in Korea with three legendary gods residing there. Yi Sunshin fought famous naval battles in Hansandaecheop (battle field) against the Japanese in the late sixteenth century among the islands of the park. Jeseungdang (Historical Site No. 113)commemorates Yi Sunshin's victory over Japan, serving as the naval headquarters for three provinces. Yi Sunshin's remains lay buried in the Namhae Chungyeolsa shrine. Boriam (Temple), established by the renown monk Wonhyo in 683 C.E. Taean-haean National Park, in Chungcheongnam-do, 326.57 km² (289.54 km² water), designated as a national park in 1978. Taeanhaean stewards several significant Buddhist temples. Beopjusa(Temple) hosts the tallest Buddhist statue in the world (33m), Cheongdongmireukbul; Bokcheonam temple, built by King Injo of Joseon to pray for the kingdom; and Daeungbojeon, a famous Buddhist prayer hall. Deogyusan in the South Jeolla province of South Korea, taken from Hyangjeok Peak. Mount Gyeryong near Daejeon in South Korea taken from Jang-gun peak. All links retrieved November 13, 2018. National and Provincial Parks Life in Korea. 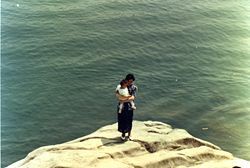 History of "National parks of South Korea"
This page was last modified on 13 November 2018, at 17:02.